Here's another absolute winner - Grilled Butterflied Prawns with Sauteed Mushroom Trio. The triumphant triumvirate of shitake, oyster and button mushrooms ups the level of this dish to holiday heights. 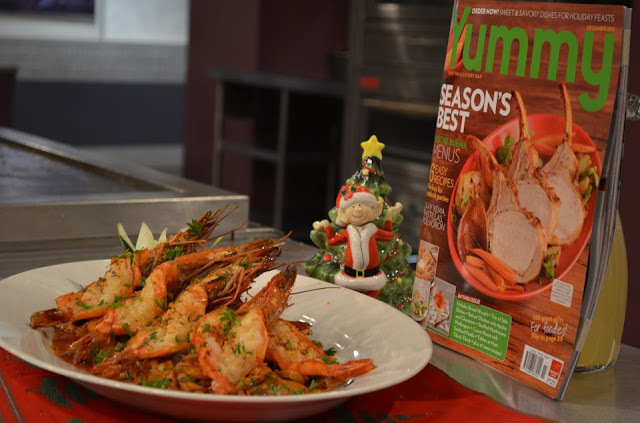 And you can't go wrong with prawns - festive, delicious, Christmas-sy! 1. Season prawns with thyme, salt, and pepper. Drizzle with olive oil. Grill using an electric griller or over hot coals until prawn turn red on both sides. Refrain from overcooking. 2. Make the mushroom topping: Season mushrooms with a little salt and pepper. In a sauté pan, melt butter. Add mushrooms and sauté over high heat until brown; set aside. 3. Using the same pan, add olive oil and saute garlic until fragrant. Add mushrooms and white wine. Cook until wine until reduced to half. 4. Add tomato paste and cook for a few seconds. Add chicken stock and season with salt, black pepper, and cayenne pepper. 5. Mix in chopped parsley and simmer for 5 minutes. Add 2 tablespoons butter and mix well. 6. To serve, arrange grilled prawns on a platter and spoon mushroom topping over the prawns.